Who are the individual landlords providing private rented accommodation? Landlords are such a diverse group of people that it’s almost impossible to reach them to communicate rules and regulations, our research has found. The research of 205 landlords across the UK that Kate carried out with the support of the TDS Charitable Foundation found that many landlords are over 55s letting out their own former home, and some are not even looking for financial gain; just buying property to rent to friends or family to help them out. TDS Charitable Foundation has funded law for Life to research the information needs of people living in the Private Rented Sector and to produce some AdviceNow leaflets. What is Law for Life? Law for Life: the Foundation for Public Legal Education is an education and information charity that aims to increase access to justice by providing everyone with an awareness of their legal rights together with the confidence and skills to assert them. Law for Life believe that everyone should understand their legal rights and obligations, and know how to gain redress through the legal system. Yet most people struggle to cope with legal issues, and often don’t know where to go for help. Being able to cope with family and housing issues, sorting out employment and benefit matters or difficulties with goods and services is crucial. These issues are the cornerstones of everyday life that can become drivers of poverty and inequality if left unresolved. Law for Life have the expertise, the practical experience, and the tools to work with any organisation that wants to support the legal needs of their service users. 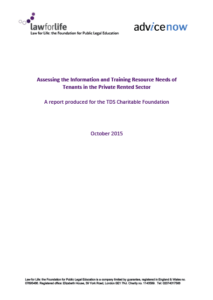 The TDS Charitable Foundation exists to raise standards in the private rented sector (mainly through the promotion of education in rights and responsibilities of landlords and tenants) and to promote the wideruse of Alternative Dispute Resolution mechanismsand to deal with tenant and landlord disputes.